Turn up the speakers and let the evil flow forth. Forgive me Father, for I have sinned. I haven’t sacrificed a goat in years, committed any heinous crimes, and, this is the hardest part, I didn’t really get into the last two Ghost albums. I know that as a metalhead I have failed you. But I am repenting with Meliora. Ghost’s strange presence in the metal scene has been defined by their balance between riffs and shtick. This is the band where all of the band members are called “Nameless Ghouls” and the same group that made an online petition to make their horrifying frontman the next Pope. After two okay-to-solid records, Ghost have finally perfected their tightrope act, melding the silly with the face-shredding to near perfection on Meliora. If you’re starving for riffs, then Meliora is a ten-course meal. Despite general goofiness, Ghost are fine crafters of headbanging noise and it shows brilliantly here. Opener “Spirit” chugs along like a long-lost Blue Öyster Cult track, “He Is” is delicious in both electric and acoustic forms, and “Cirice” has one of the finest (non-Queens of the Stone Age) guitar leads of the last few years, conjuring up Metallica’s heyday with all the Fade to Black aesthetics presented with a modern polish. "Conjuring" is a fine word for what Ghost do on Meliora not just in the sense of summoning unspeakable horrors, but in the setting, carefully painted with smoke, crystal balls and hellfire. 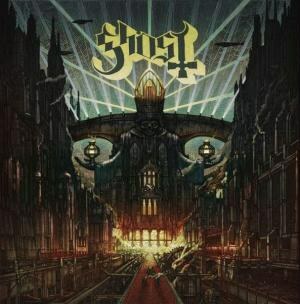 Ghost are still plenty playful (they have a song called “Mummy Dust” for Satan’s sake) but the balance between demonic glee and regular old glee has never been better. For all their wants to engulf the world in flames, Ghost are having a hell of a lot of fun. The Scooby-Doo organs are still here (“Majesty” might have been improved by a “and I would have gotten away with it…” soundbite), but the Nameless Ghoul who mans the keys is at his finest on Meliora, filling space appropriately, but also giving the whole project its atmosphere. Interlude “Devil Church” is a prime example, extoling the virtues of the father below without a single word. Though this Ghoul’s spotlight moment is closer “Deus in Absentia”, where his organ turns into Halloween theme ivories, somewhere between Sabbath and John Carpenter. The shadowy figure honing his keyboard skills isn’t the only one who’s improved. This might be the best incarnation of Papa Emeritus yet. For those who haven’t waded through Ghost’s complex mythology, Papa E is the anti-pope who also fronts Ghost. It’s a title passed down through three singers so far. And Papa Emeritus III is the best version yet, with a knack for incantations and piercing vocal lines. Papa Emeritus’s vocals aren’t the only range that’s expanded. Meliora has a lovely tendency to experiment, but still sound unmistakably like Ghost. “Mummy Dust”, “From the Pinnacle to the Pit”, and “Majesty” are for your straightforward metalheads, while “Spirit” ratchets up the production with a choir and Twilight Zone organ, a fitting, and damn near perfect, opener for the project. “He Is” could be mistaken for a worship song in a mega-church and that’s not a demerit against the track. The chorus is massive and begs for a sing along, and has given me my new dream of replacing all the hymnals in a televangelist broadcast with Ghost CDs. Closing track “Deus in Absentia” is the weirdest piece here, leading off with a Scandinavian tango before bursting into a chorus of “the world is on fire!” The song also closes with a choir intoning the demonic prayers of the ghouls because why not. Lead single “Cirice” ends up being the finest track here, and, perhaps, the best thing Ghost have done yet. It’s all swooning melodrama engulfed in face-melting riffs and deft keyboard work. The verse to chorus shift is a brilliant dynamic contrast of crushing grit to heavenly release. Papa’s voice morphs just as easily as the music as his “can’t you see that you’re lost without me” tempts some poor mortal to join the dark side. It’s appropriately epic for a song that probably contains the exact chords to summon the dark lord himself. It’s hard to imagine having more fun with a metal album than with Meliora. It will be a treat once Halloween rolls around, but, even in these sweltering summer months, Ghost usher in the darkness with glee. To misquote a certain boxing gloved internet celebrity: Hunch all up on yourself, turn up the speakers, and let the evil flow forth.